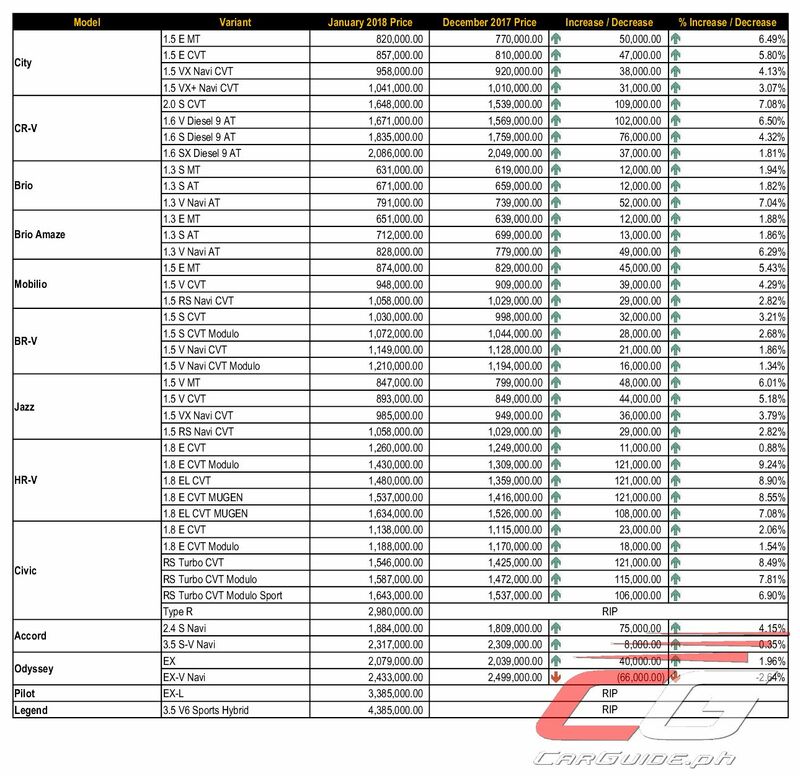 Honda Cars Philippines (HCPI) is the first carmaker to official reveal their post-TRAIN prices effective January 1, 2018. Posted on their official website (and not leaked through dealers), the new prices effectively see Honda’s prices go up across the board. As expected, the Honda Civic is heavily penalized under TRAIN with as much as an 8.49 percent increase in its Suggested Retail Price (SRP); ditto for vehicles within the same price range including the CR-V and the HR-V, the latter of is the hardest hit (prices increased by as much as 9.24 percent). 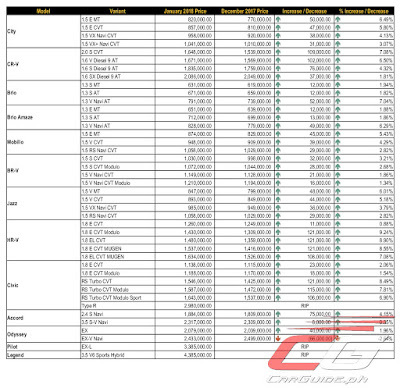 The only one that actually sees a reduction is the Odyssey, particularly the EX-V Navi variant (2.64 percent). 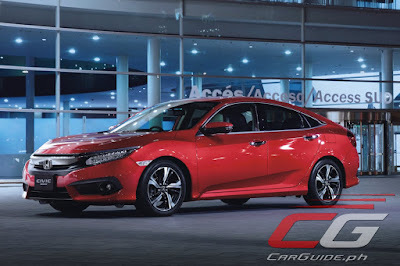 Interestingly, HCPI decided to discontinue some models with the Civic Type R, Pilot, and Legend all getting the axe (those that are on dealer lots are from 2017 they tell us). For those keeping score, comparing the final prices versus our estimation last month, we are off by less than two percent (the highest variance being at 1.90 percent). And this was with us having to work backward basing our assumptions from data available; so take that, social media influencer who took our table out of context! Anyway, if you got yourself a brand-new Honda last month (especially the Civic, CR-V, and HR-V), then consider yourself lucky! You just yourself a great deal. Note: we have updated the table to make the graphics clearer. Remember, you can download the file by right-clicking the image below. It is pretty high-res. Tanong ko lang po. Bakit po nakasulat na RIP or Rest In Peace sa mga Prices ng Civic Type R, Pilot and Legend? 3. Most likely, or they'll count their losses and won't bring in the facelift model. Although, the price should go down to something like P 3.5M from 4M plus. The Legend was sold with a 2M discount towards the end of last year. All units were gone within a few weeks. I doubt if Honda will still sell the facelifted variant. Woah.. source Sir palink naman. Ridgeline? Sabi hindi daw totoo decrease ng price sa pickup? The Congress version specified that only single cabs are exempted. That was removed in the final version. Nissan already has the AD Resort years ago before the Tax reform law, and Subaru also has the Brat due to the US chicken tax. So was the Pilot. That didn't stop Honda from bringing it here. Both are hampered by their high fuel consumption and higher cost of gas. Maybe that's why the Pilot never took off and never had a chance. I was off by 7000 on the City E CVT. I predicted/calculated 850,000. I was off by 8k on the VX. Same respectively for the Jazz V and VX. Not too far off the mark but still a little bit disappointed it wasn't less than what I expected. Honda actually quietly increased their prices by about 1% last November. I guess it's moot now. Oh well. Honda really likes to rake in the money. It doesn't lower the prices which should go down. But they're quick to raise those that gets hit with a higher tax. Acting like there's no competition. Let's see. "Honda Cars Philippines, Inc. reserves the right to change prices at any time without prior notice." It would great to see a significant drop in sales for car companies. Then that's the time they'll gonna give discounts. LOL!